Voilà, Chaussons aux Pommes are great, simple, and so French. No Boulangerie in France is without them. With food, sometimes simplicity can be the ultimate sophistication and Chaussons aux Pommes definitely fall into this category. 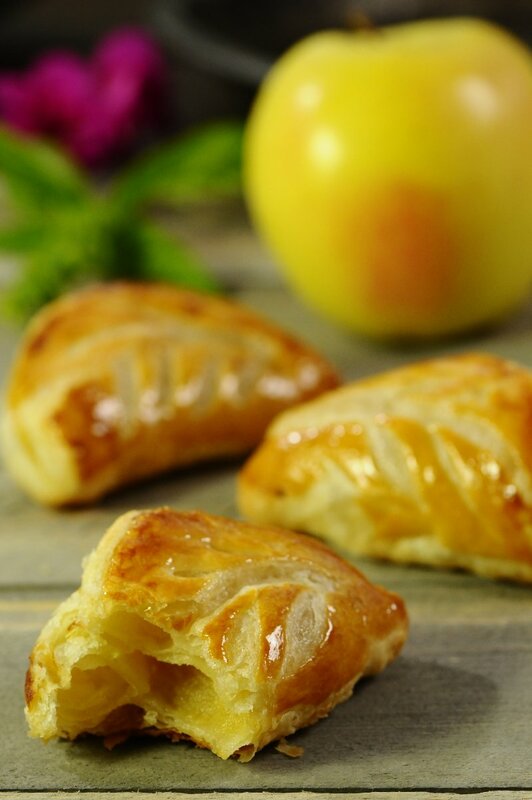 According to legend, Chaussons aux Pommes (apple turnovers) were invented in 1630 in Saint Calais in the Sarthe region of France. The town of Saint Calais was suffering from an epidemic and the Chatelaine, the lady of the town, distributed flour and apples to the poor – and they made apple turnovers. A simple recipe; however, like everything with cooking or baking, the details are important and make the difference. Making puff pastry at home is a rainy weekend project and isn’t really that difficult. It just takes some time and refrigerator space. To be honest, I purchase Dufour Classic Puff Pastry from Whole Foods; one of the most buttery and flaky pastry you will ever find. Chaussons aux Pommes are a very occasional treat for me. We all agree, puff pastry is not exactly considered a low calorie food. Sometimes you just need to go for it and enjoy a pastry that is so French. When I indulge, I enjoy it. I don’t feel guilty, defeated or regretful because I know that overall I eat in moderation. We all deserve food that brings back memories and makes us feel good. We all know eating healthy can be hard and once in a while you need to reward yourself. I avoid processed food and eat clean food as much as possible. Don’t get me wrong, I eat junk foods. But I eat homemade junk, where I can control the ingredients and cook a healthier version. I know that I will bake Chaussons aux Pommes again – because the day will come where I will reward myself again and a few freshly baked awesome Chaussons aux Pommes fit that bill perfectly. Apples vary widely in their flavor so picking the right apple for apple sauce is important. I personally like the Golden Delicious. They are sweet, tart and almost buttery, well balanced and rich – especially when cooked. Bake seasonal and purchase apples from a local farm or your farmers market. You can jazz up your applesauce with these mix-in suggestions: raisins, dried cherries or dried cranberries, orange zest or your favorite ground spices, such as cinnamon or ginger. The crust is decorated with a leaf design and glazed with a syrup. Brush the Chaussons aux Pommes with egg wash and let dry for about 5 minutes. Repeat and brush again with egg wash. With a sharp knife “cut” a leaf design into the Chaussons aux Pommes. Brushing the Chaussons aux Pommes with sugar syrup after they are baked and putting them back into the oven for another minute, makes the syrup caramelize and gives the puff pastry that slightly sweet taste and awesome shine. For me, baking a recipe that has been used for over 400 years belongs in the tradition over trend category. 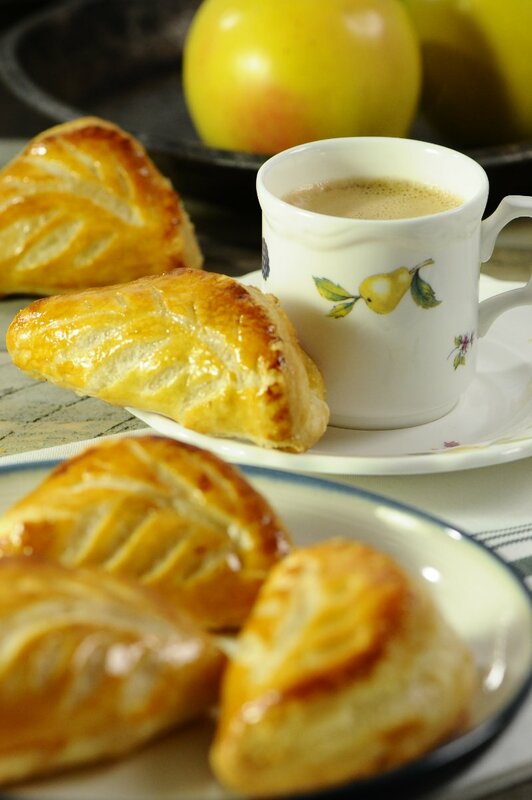 The Chaussons aux Pommes recipe is a pastry that makes you look back in time and history. 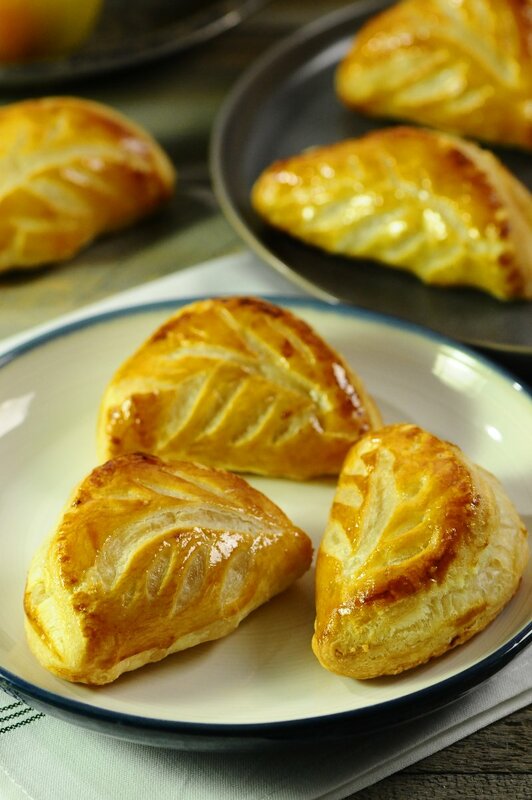 Just imagine, Chaussons aux Pommes were baked well before the French revolution. I know you agree, a recipe that has survived this long has to be a really, really good recipe. 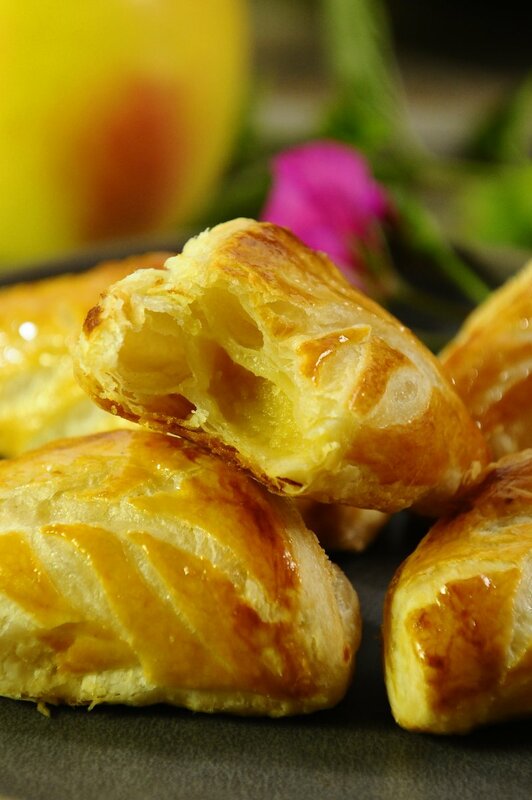 Delicious, the flavor of puff pastry, vanilla, butter and apples is amazingly simple and good. A home-run in the flavor department. 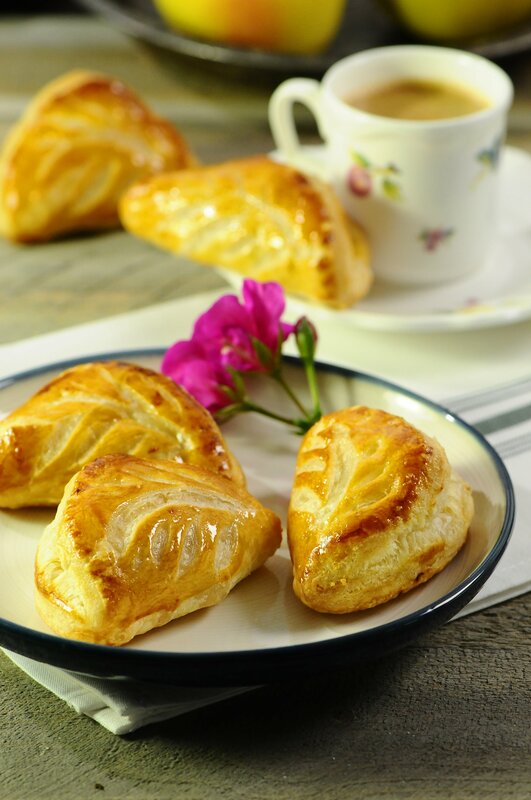 By purchasing a good quality store purchased puff pastry, they are easy to make. One piece of advise, make plenty because I ate all of them during the photoshoot. Simplicity can be the ultimate in sophistication and Chaussons aux Pommes are exactly that. The recipe puts you back in time where food was made with quality and flavor. You will love the clean flavor and served with a great cup of coffee, you will be in heaven. Cook apple sauce: Peel, core and dice apples. Add diced apples, sugar, butter and water to sauce pot. Cover and bring to a boil, then reduce heat to a simmer and cook for approximately 20 minutes, until apples are soft. Remove apples from sauce pot and puree in robot coupe. Return to sauce pot and cook uncovered over medium until reduced by 1/3 and thickened. Set aside. 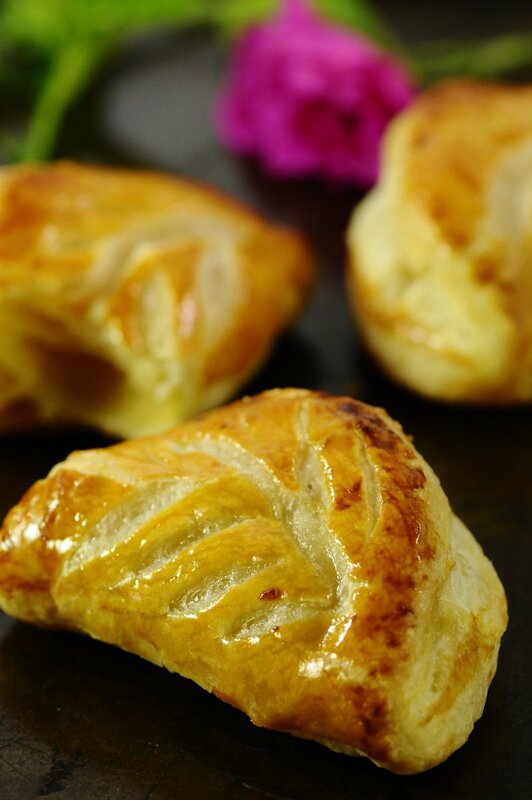 Make Chaussons aux Pommes: Defrost package of puff pastry dough in refrigerator for two to three hours or at room temperature for one to two hours. Do not leave sitting out after defrosted. Refrigerate if not using immediately. Unwrap pastry and place on floured board or table. Unfold, remove inner papers and dust lightly with flour. Turn over and flour the other side. Using a pastry cutter, cut 8 circles approximately 4 to 5 inches in diameter. Roll the center of each puff pastry circle a little thinner, however, you want to maintain the original thickness of the dough on the end. 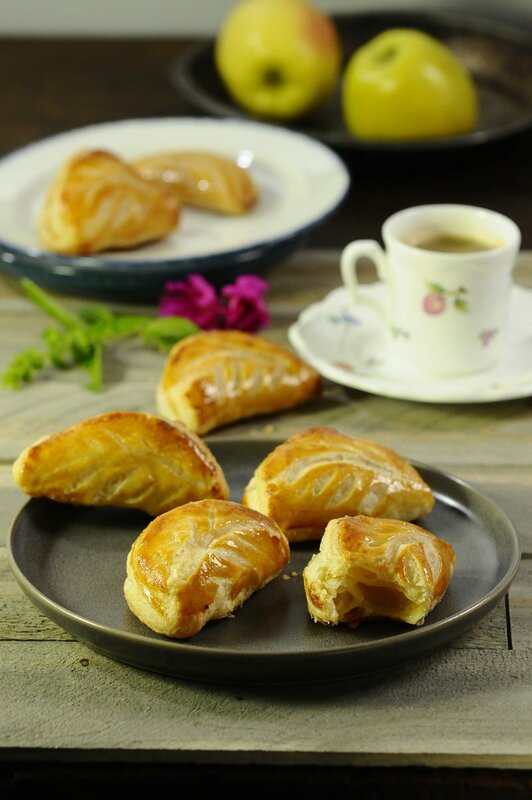 Mix 2 egg yolks with 2 teaspoons of water and brush the puff pastry circles with the egg wash. Add about 1 tablespoon of the apple sauce to the center of the puff pastry circle. Fold over to create a pocket, with a little pressure seal the border of the turnovers. Brush the Chaussons aux Pommes with the egg wash and let dry for about 5 minutes. Repeat and brush again with egg wash. With a sharp knife "cut" a leaf design into the Chaussons aux Pommes. You want to keep the knife very loose and gently cut the center of the leaf design then the sides of the leaf design. Again, I'm using the word cut very lightly. Finally add 3 small holes into the dough so the steam can escape during the baking process. Preheated oven at 400 F. While the oven is preheating, make the simple syrup. In a sauce pot combine water, sugar and bring to a boil and set aside to cool. Place turnovers on sheet pan and bake for about 18 to 24 minutes or until golden brown. Remove from oven and brush the turnovers with sugar syrup. Return to oven and bake additionally for about one minute. Remove from oven to rest, then serve and enyoy.